The climb ahead of us resembled something I’ve encountered many times trail riding in Wales or Devon; a steep, rocky ascent of loose stones with mud, water and a thought-provoking drop to one side. The difference here was that the drop to my left was at least 1000′ straight down to a distant river, and the tyres on our bikes didn’t look like they could grip their way out of a wet paper bag. 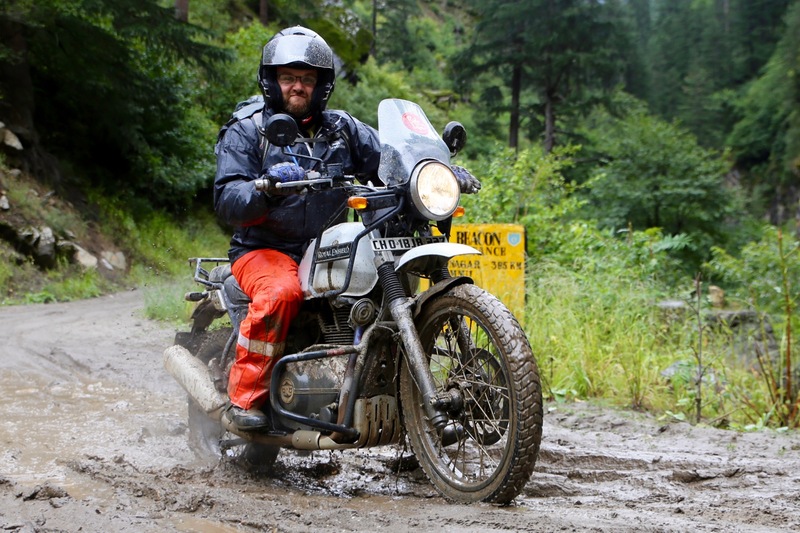 Despite that, the Enfields bounded up the slope like a Himalayan oryx, quite an achievement considering that some in our tour party had little off-road riding experience. 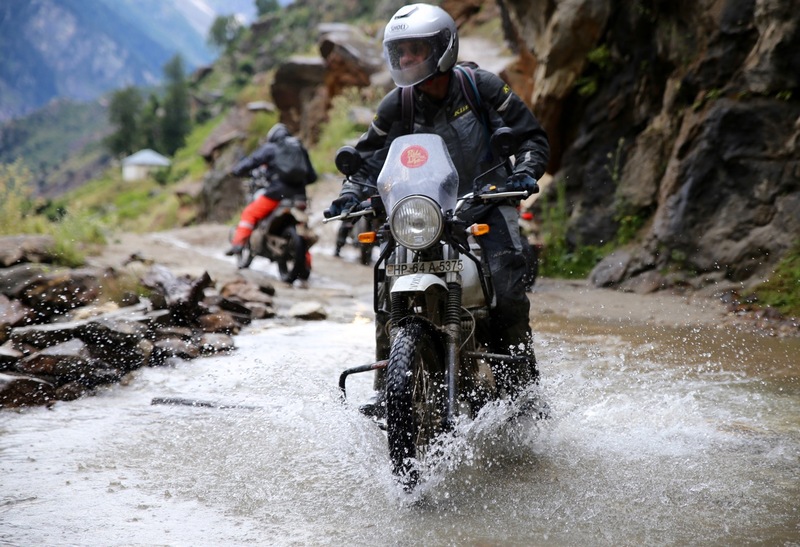 The new Himalayan is the first completely new bike from Indian Royal Enfield company. The well-known Bullet and its many derivatives can trace their ancestry back to the original British-built thumper from the 1950s. 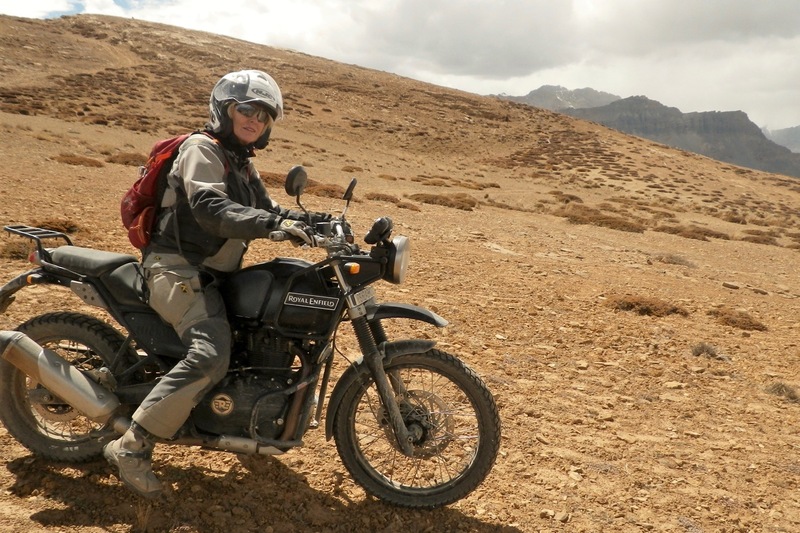 Danielle and I have done several Bullet tours in Rajasthan, Arunachal Pradesh, Ladakh and Nepal. 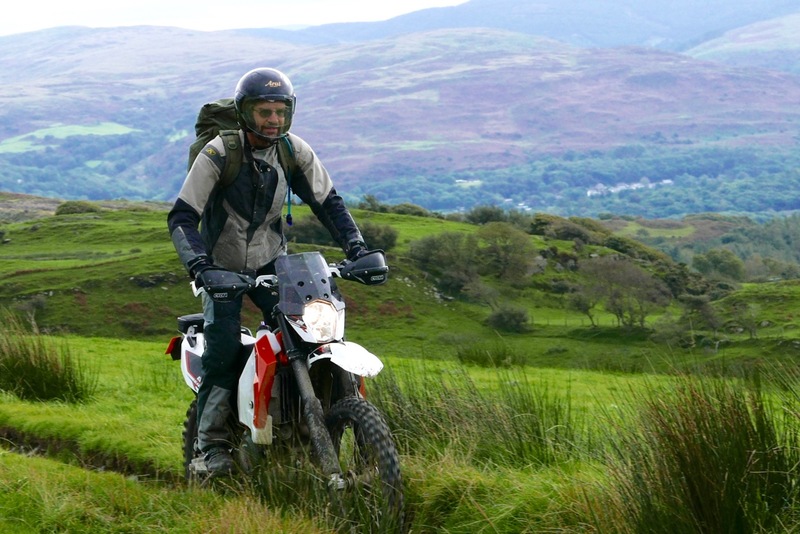 It’s a fantastic bike but when the terrain gets really rough and the riding technical, the lack of ground clearance and poor ergonomics on the pegs expose its limitations. 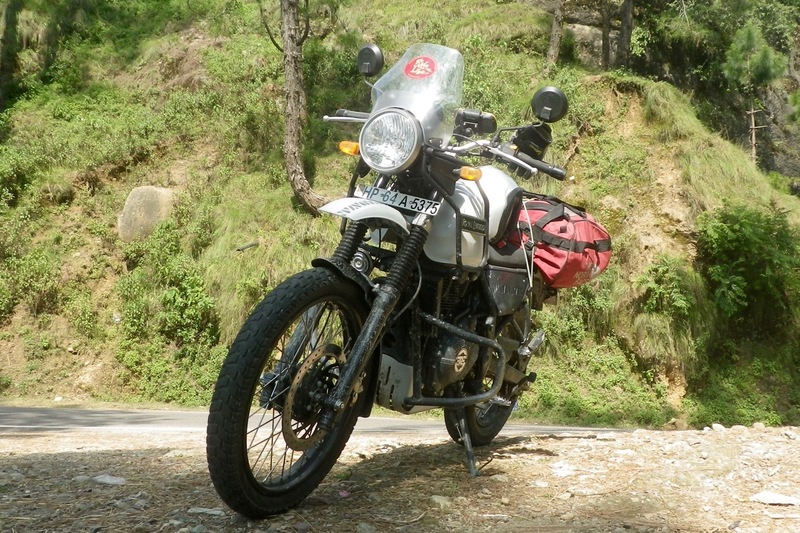 In contrast the Himalayan has been designed to be ridden sitting or standing. It has much better ground clearance of 8.6” (220mm) but a modest seat height of just 31.5″ (800mm); which potentially opens the bike out to many less tall riders. 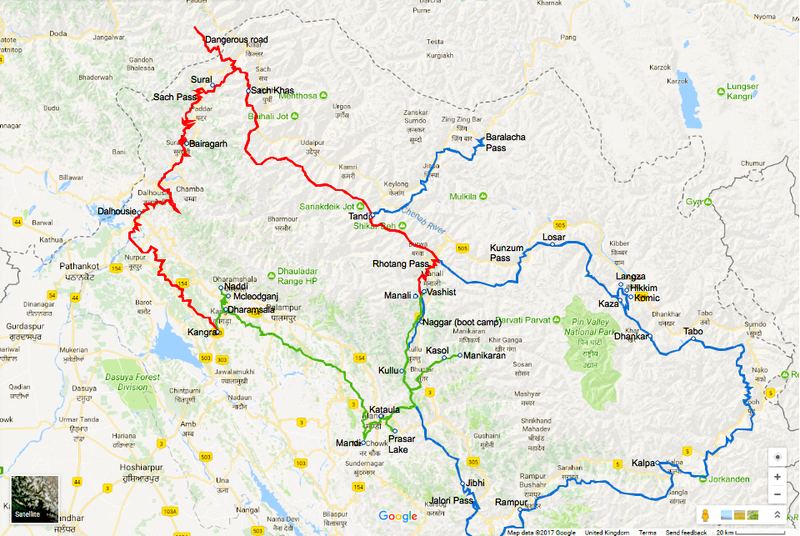 It was also designed to be comfortable on the road over long distances, handle the twisties (lots of these in the Himalayas) and have a fuel range of over 250 miles from the 14-litre tank, (sounds like at least 70mpg). If this sounds like an adventure bike as opposed to another adventure-styled bike, then you’d be right. What it’s not really suited to is cruising all day at European motorway speeds, but then India isn’t known for this sort of riding. In India in 2017 it sells for 155,000 INR, or under £1900. When it arrives, UK efi Euro 4 prices are quoted at £3999. Below, a 2018 US review of the efi model. The look is a bit 1980s, recalling the Suzuki DR400 or DR600, although the headlight and instrument cluster are mounted on the frame, not the forks. There’s an element of BMW F650GS Dakar in there too. 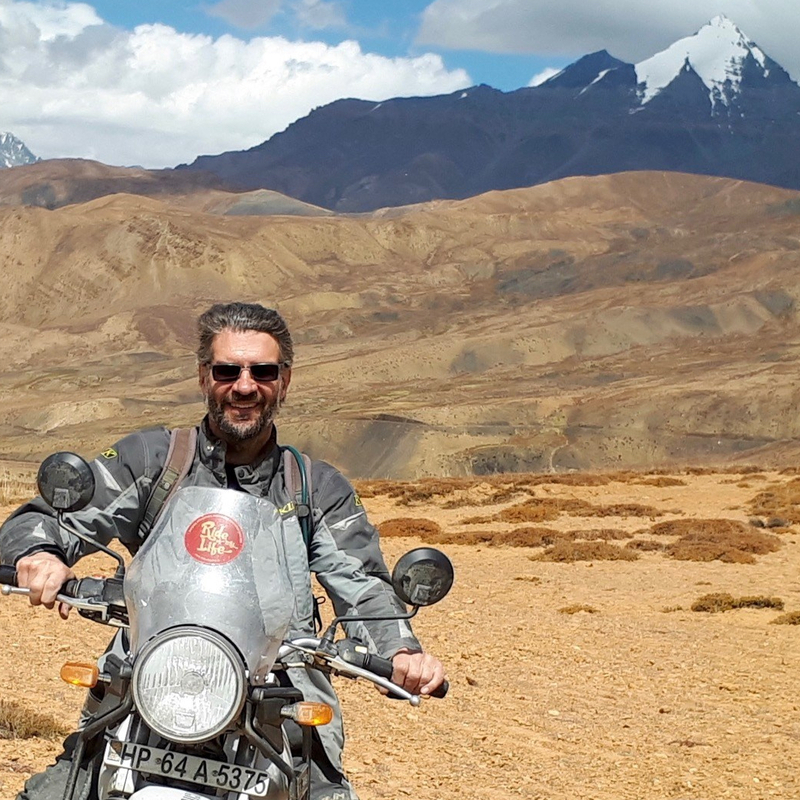 For me the greatest impression was one of practicality and quality, from the solid paint finish to the alluringly cryptic HIMALAYAN logos on the tank, mudguards and side panels, as well as the large LED tail light. It comes in appropriately mountainous Granite or Snow (black or white to you and me) and looks purposeful in either. The engine is a long-stroke 411-cc air and oil-cooled lump with a balancer shaft. The word ‘lump’ being appropriate, as the crankcases appear to be off a much larger bike; maybe they intend to produce a large capacity version in the future? Peak horsepower is claimed to be 24.5 bhp, about the same as the 2017 Honda CRF250L, but there’s 50% more torque, and crucially it’s all delivered at much lower revs. Coming off my 70-bhp KTM 690R (left) and a R1200GS, I didn’t find the lack of power a problem. The bottom-end torque and smooth power delivery made that modest power very usable. 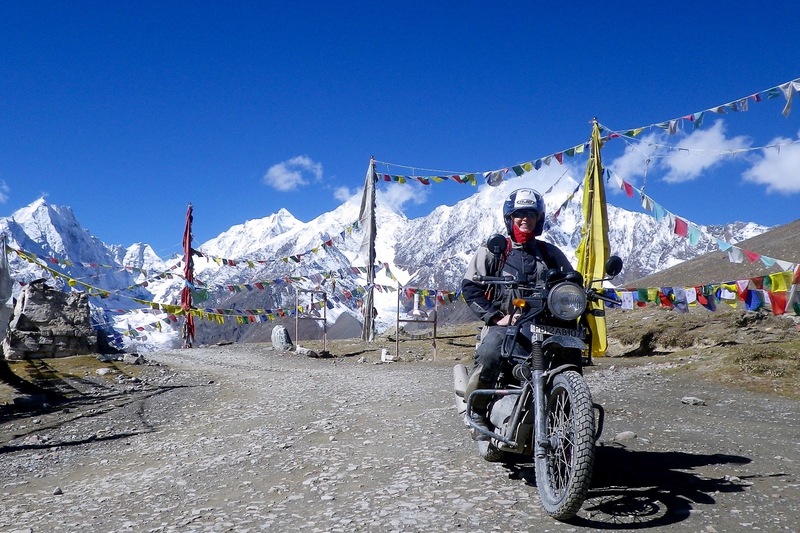 The only glitch with the engine was a flat spot around 4000rpm, most noticeable at altitude (we rode up to 16,000ft/4870m on this trip). You soon learn to ride round it and I suspect a good engine tuner could sort the carburetted version we rode. The fuel-injected version to be sold both in India and globally is bound to be better in this respect. On the left of the front down-tube is a good-sized oil cooler, and there’s an all-stainless exhaust with a nicely shaped, cat-free silencer. I imagine the UK version will need a bulky cat. At the other end is a well-sealed airbox with a high air intake and a large, cylindrical dry-element filter. Top speed is claimed to be 134kph or about 84mph, but the nature of the terrain we rode meant the most I saw was just under 100kph. It’s a long old way down. 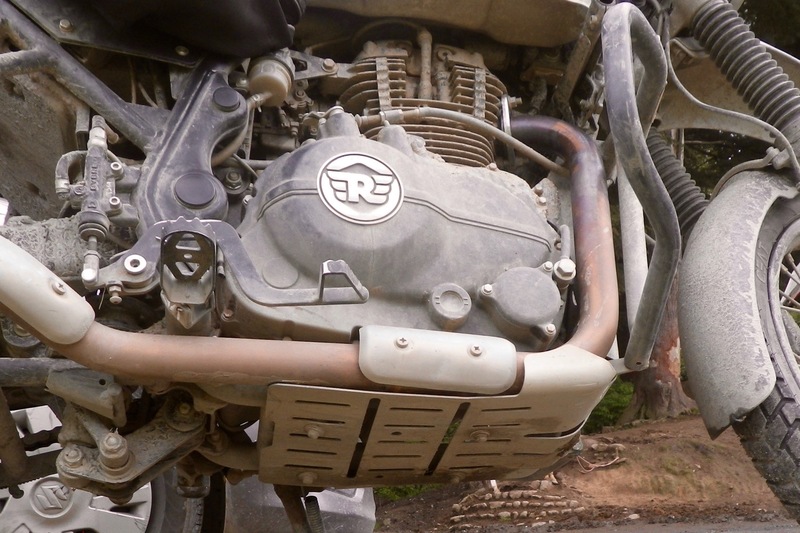 Some riders thought the 5-speed gearbox was a little stiff, but on our bikes the clutch cable had been routed around the outside of the aftermarket crash bars causing a bit of cable drag. The frame is a conventional steel-tube cradle designed by Harris Performance (who Enfield bought out in 2015) and finished in satin black. The rear end is monoshock and perhaps the only unconventional feature are the subframes either side of the tank which support the headlight and instruments. 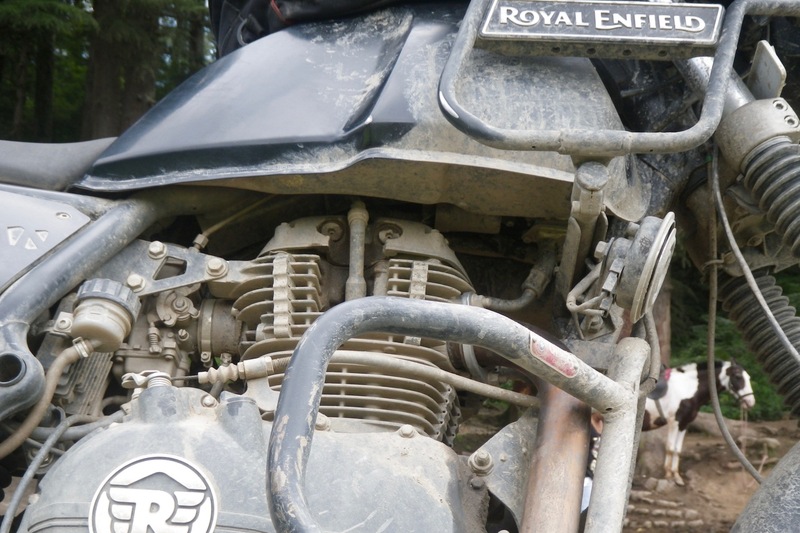 Each includes a series of threaded mounts to attach extra tanks, luggage carriers or an aftermarket fairing. The aluminium bash plate looks a bit flimsy, but proved to be up to the job as the clearance was generous. 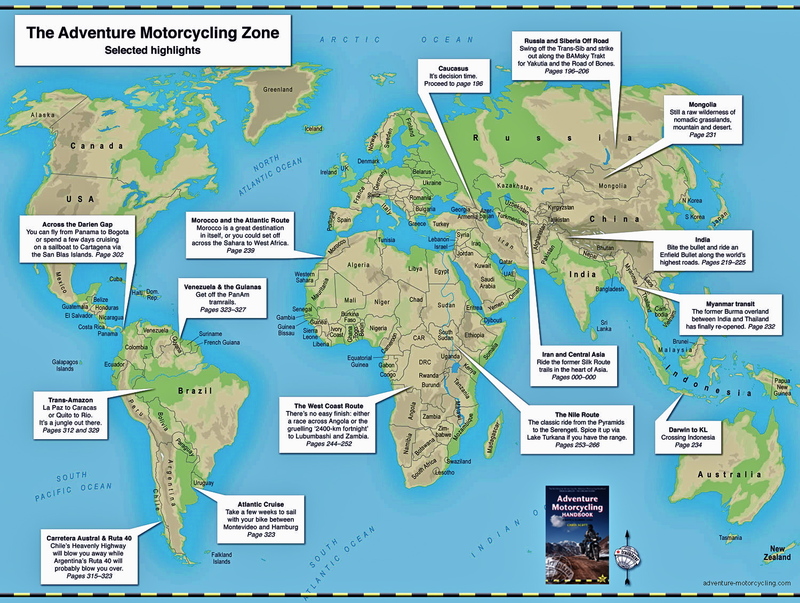 Surprisingly, hand guards are not standard, though our rental bikes did have poorly fitted aftermarket crash bars which clanged over bigger bumps. I cured this by jamming a wooden wedge into the mounting assembly. You also get sturdy centre- and side-stands which tuck out of the way. Wheels are 21” front and a 120/90 section 17” at the rear on black alloy rims shod with Indian Ceat Gripp XL trail tyres which resemble Dunlop Trailmaxs. On rocks, gravel and dry mud, they worked well enough if pressures were dropped to 20 psi. 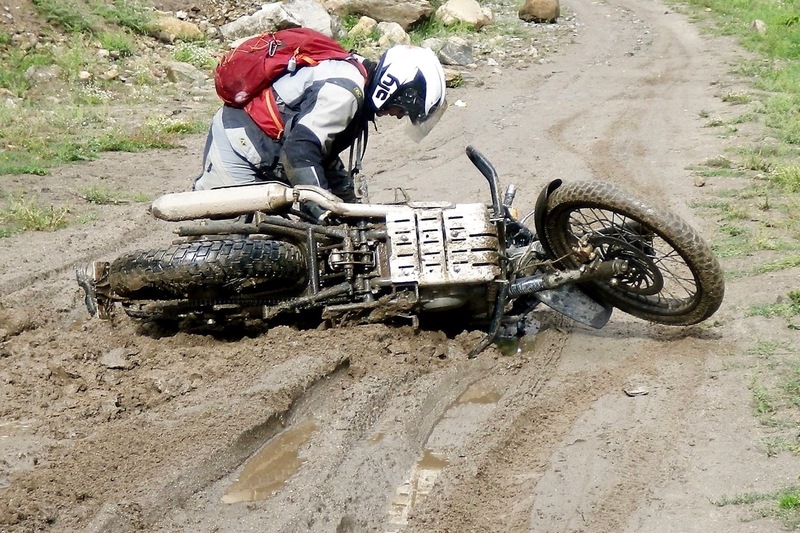 On muddy ruts and wet grass you just have to take it easy or you’ll end up as on the right, but they’re helped by the gentle power delivery; it’s almost like having traction control. 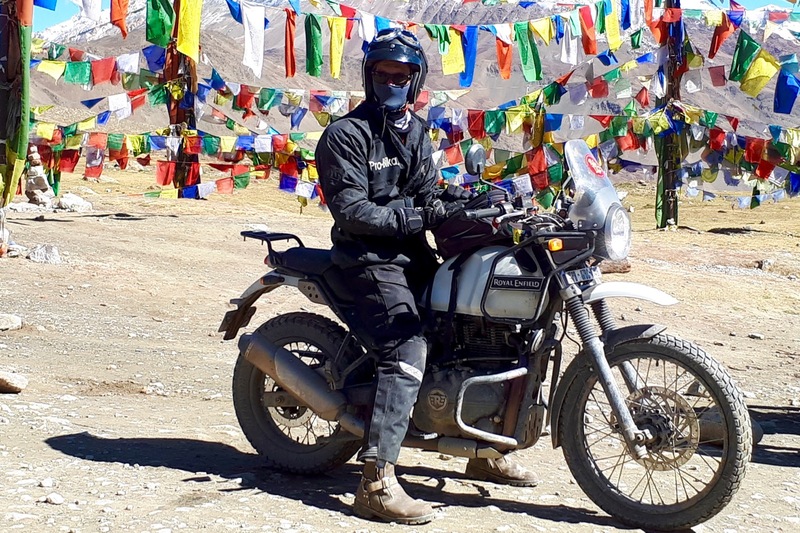 The Himalayan does not, of course, have traction control, ABS (in India at least), power modes, suspension modes or any a la modes, but manages fine without them. Initially the forks (180mm) felt very softly sprung; far more trail bike than my hard-charging 690 enduro. 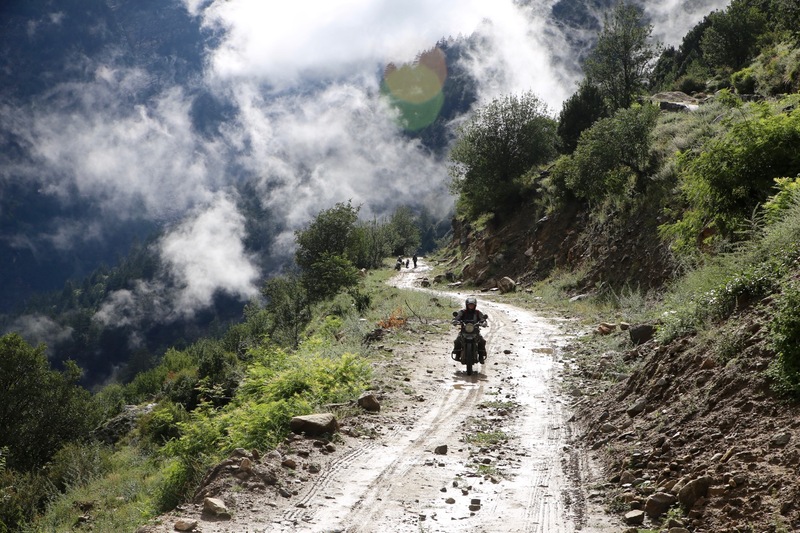 However, the springing and damping were well matched making riding over rocks very easy; the bike always went where it was pointed. There’s no adjustment on the 200-mm-travel rear shock except preload. The brakes look like Brembo copies with braided, stainless brake lines. At the speeds attained they worked for me. If the bike were mine, I’d fit one-inch bar risers, but then I am 6’ 1” and fit risers to all my dirt bikes. The 31.5-inch seat is low for an off roader which makes standing up a bit more of an effort, but was comfortable enough for all-day riding. 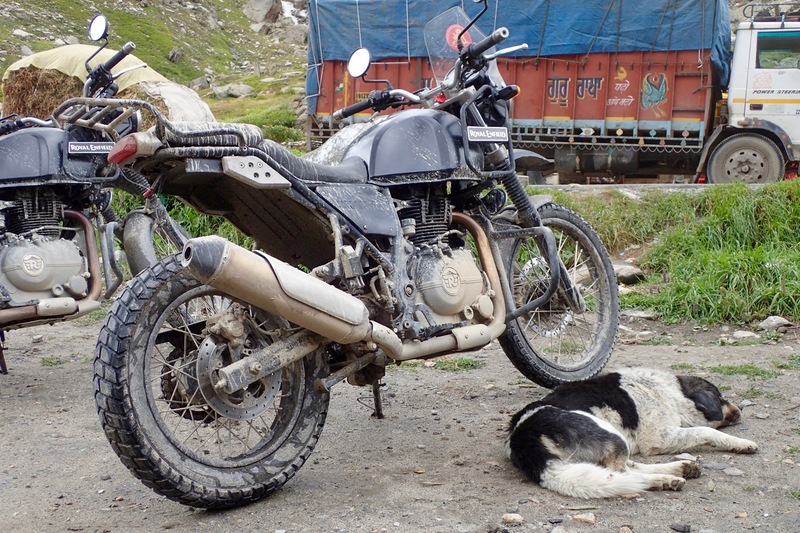 Before the trip Dan (5’ 6”) had some concerns that the 182-kilo Himalayan would be too tall and heavy but she easily got both feet on the ground and loved the bike too. The bike is fitted with a small screen to help reduce the wind pressure at speed (or at least the speeds we reached on this trip). Dan removed hers to improve visibility on dirt roads. It can make a real difference to confidence. 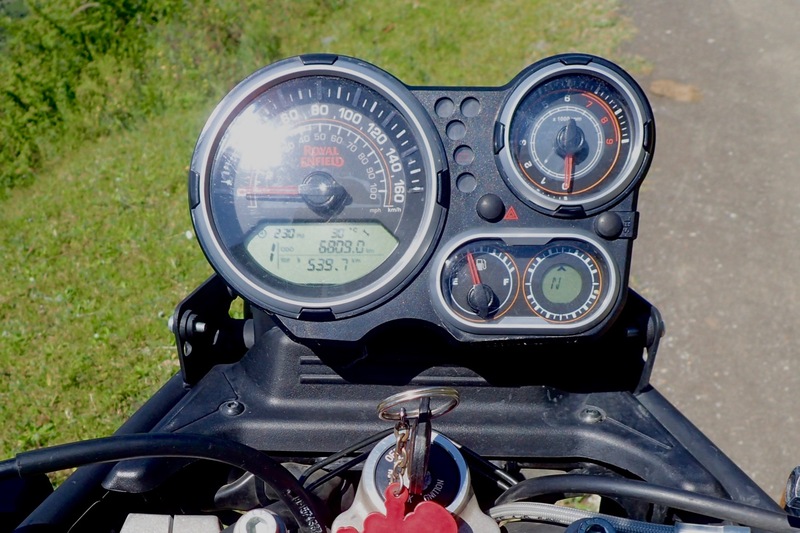 The analogue instruments have enough of the information and features you’d expect of a modern bike, plus a couple you wouldn’t: oil temperature and an electronic compass. I love the latter idea; in a country where fitted GPS is rare, it helps affirm you’re heading in the right direction. Besides the tank frames the bike also comes with a small rear rack and several points to attach pannier frames. 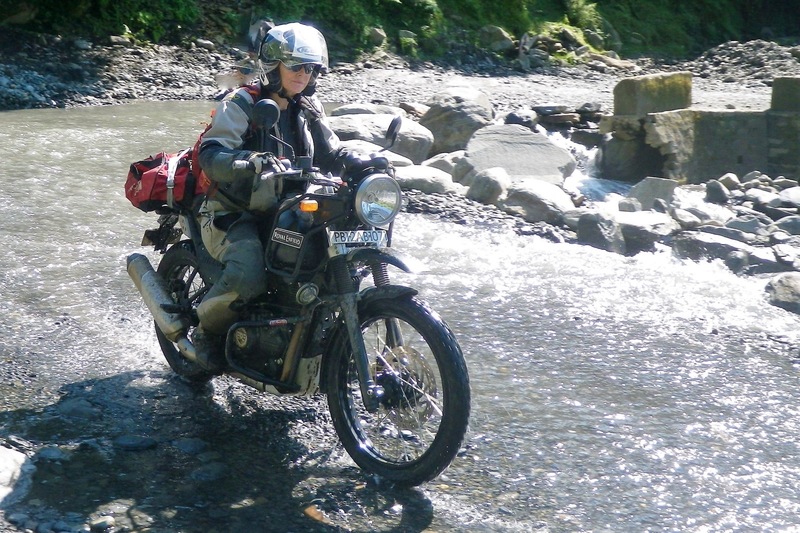 Some people complained the upswept exhaust made mounting luggage more difficult than on a Bullet, but if they stall in a river at least it won’t fill with water. 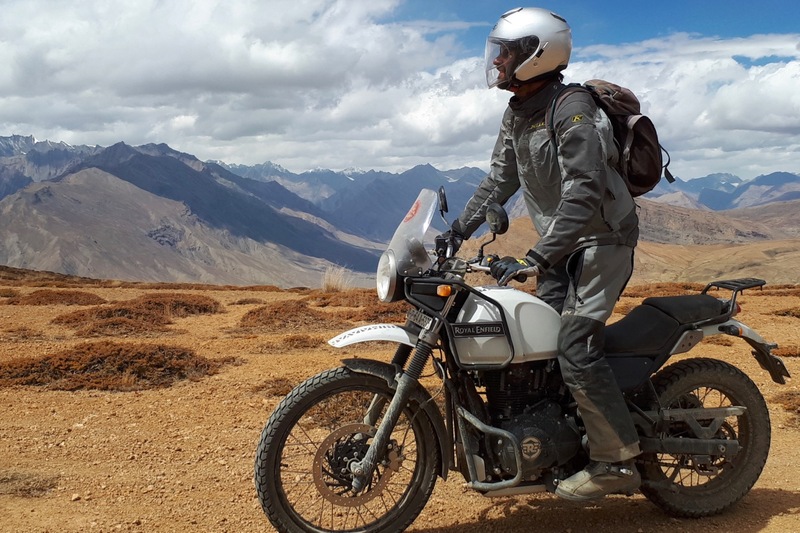 Compared to most modern bikes the Himalayan is basic, but everything appears readily accessible with a comprehensive tool kit sits under the lockable back seat. According to the service interval, the 2.6 litres of oil needs changing every 6000 miles or 10,000km. 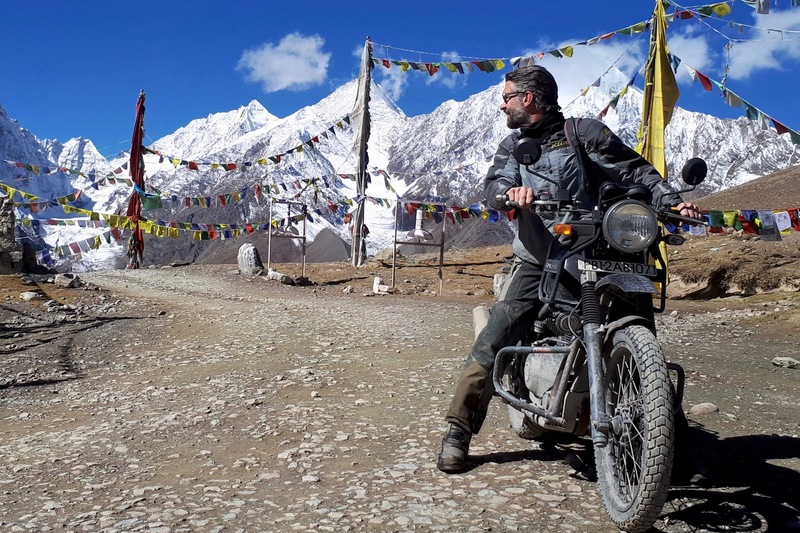 I’ve ridden all sorts of bikes in all sorts of places and am convinced Royal Enfield have done something special with the Himalayan. 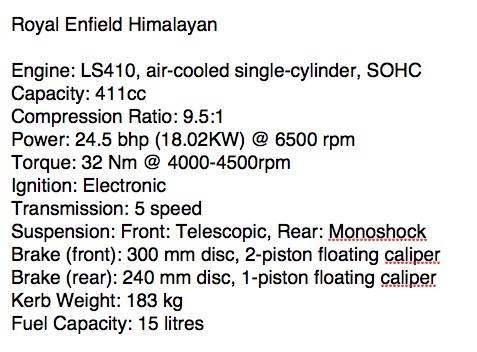 There’ve been a few teething troubles, as you’d expect for a new design from any manufacturer, but Royal Enfield have been responsive and you’d hope by the time we get the Himalayan in the UK, these will have been sorted. 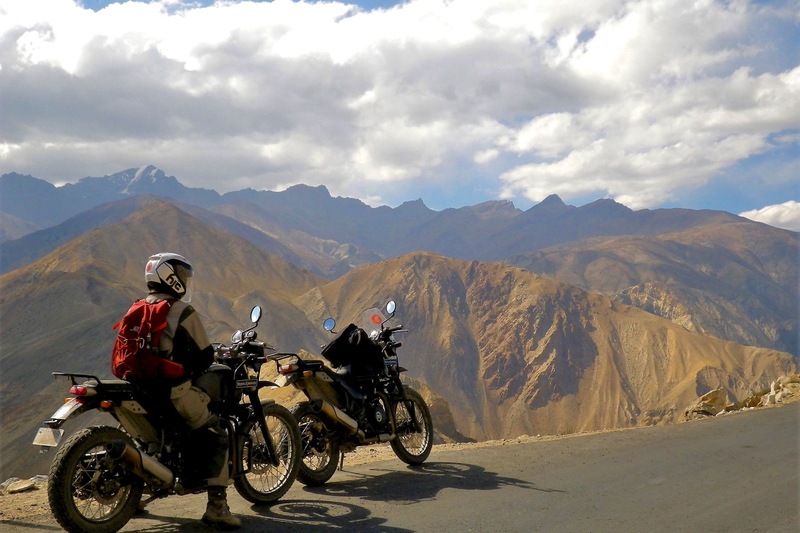 The suitability of the bike for India and specifically the Himalayas is undeniable, but would it be suitable elsewhere? After a month and a few thousand kilometres in India, I’ve no doubt that given a set of better tyres it would be able to tackle the majority of the UK trails I regularly ride. At over 180 kilos it is significantly heavier than other trail bikes of this capacity, even a KTM 690R or BMW XChallenge, but the low seat combined with the soft suspension and progressive power delivery make it very easy to ride. Would I enter it in an enduro? Only if I felt like winding people up. Would I ride the Trans-Am Trail on it? Absolutely. Round the World? Maybe, once I assessed long-distance, all-day road comfort and reliability. Is it fun? Yes! 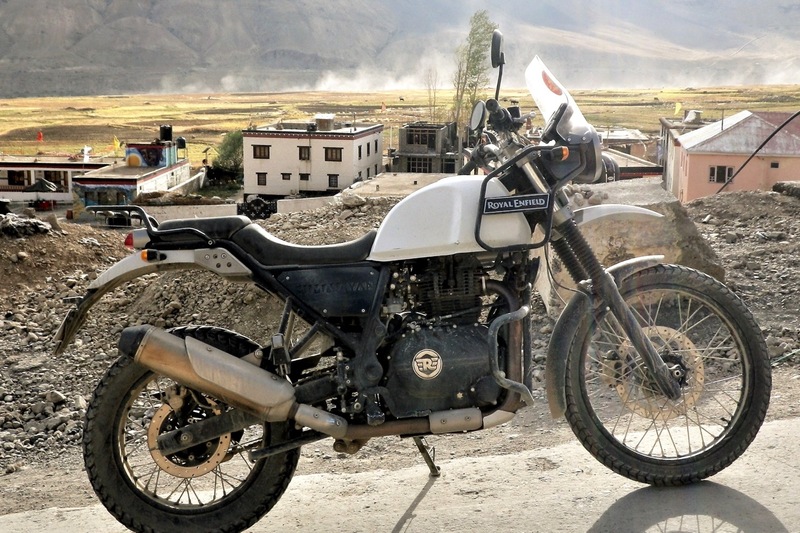 This entry was posted in AMH News, Project Bikes and tagged royal enfield himalayan. Bookmark the permalink.